Remember the scene in a Jedi conference room midway through the film, which Cody interrupts to report that Obi-Wan has engaged Grievous, and the Jedi then discuss their plan of action vis a vis Palpatine? EDIT P.S. : Earlier somebody mentioned (maybe JediMAC, I'm too tired and lazy to go back and look) the idiocy of the seeming randomness on the numbering. Why do THESE repaints get new numbers, while the recently announced clone repaints do NOT? Just makes it so much more diffcult to keep track of. In my book, they should all get new numbers. Yeah - I remember the scene - it was supposed to be longer than what we saw even - Aayla was supposed to have one or two quick lines so I guess it's okay - I would just rather have holograms so I could re-create a ROTS Council Scene. I think that was me commenting on why the Red ShockTrooper Repaint, the Green Clone Commander and the Black ClonePilot all have their original numbers, yet these 12, since Hasbro is heralding them as the next 12 figures in the line, I don't understand why figures like the Commander Gree, 501st Legion Trooper, Nemoidian Warrior, Wookie Warriors, astromechand hologram Jedi are all getting new figure numbers. They should just be variants of the already released figure, 'cause that's all they are. You know something just occurred to me - they DIDN'T give the Royal Guard variants their own individual numbers, yet they're going to give a repainted Wookie Warrior a NEW Number?!?!?!?! To quote C-3PO, "This is madness!" After having a little time to process all this, I guess I can see the point made earlier that maybe (hopefully) we're getting repacks like this because Hasbro is working towards some all new sculpts for the unified line for the end of 2005 and 2006. I hope that is the case anyways. When I first saw that all of these were repaints/redecos I thought "this is the beginning of the end". Don't get me wrong, I like some of these...love the clones...and I'll probably pick up about half of them. I worry that they'll be tough to find, specifically the clones, but that isn't new I guess. I agree with others, these wouldn't have bothered nearly as much if they were spread out a little bit with some new figures in between. I really think Hasbro needs to bust out some new stuff (hopefully OT stuff) during the Con, whether it be at their presentation or afterwards. They need something more positive to come out of their show, and right now I don't think that is happening. Like some of you have mentioned, these figures aren't necessarily bad...but for me its been the combination of the news/pics we've seen this weekend. Outside of the Force Battlers line that virtually no one cares about, every other line is doing the repack/redeco exravaganza (Galactic Heroes, Unleashed, basic figures, vehicles, etc.) That is the problem I think. Definitely glad we're getting Gree, Bly, and the 501st Clone though...those look nice. At first, it was said she is Shu Mai in a different outfit... but now some people are saying it isn't Shu Mai but rather her aide? Sounds like EU junk to me. Any of you EU guys know what I'm talking about? Also, one thing I didn't quite notice on this figure last night (probably due to sleepiness), but is that supposed to be Lightsaber damage on her torso? It sure looks that way - was this character (regardless of name) one of the ones Anakin killed on Mustafar? Another puzzling thing to me is why bother molding/producing new style figure base? I mean this new "flame" one will be used with what? 4 maybe 5 figures tops? Stoopid. I take it back - that figure is great now. Next up, slashed Nute Gunray. I just read over at RS someone called this Cat Miin. Shu Mai does actually have an "aide" that can be seen really briefly in the Separatist bunker during the conference with Palpatine prior to Vader's arrival. It's one of those "Djas Puhr-esque" cameos, in that she's in the corner of a frame and barely visible, but there is an aide standing there. Whether that is who this is supposed to be or if it's Shu Mai in a different outfit, I don't know. Jeez, no kidding. 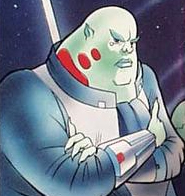 The one Separatist that it would make sense to release as a carded figure (since he's, you know, in all three films and after Dooku and Grievous, the visible head of the Separatist Leaders; not to mention my favorite background character in the prequels), and they pick Shu Mai/Cat Miin instead. I actually wouldn't mind seeing a Nute Gunray as well, if they are going to repack Seperatists anyways. I never picked up the Ep 1 or Screen Scene ones, and I'm sure the EP1 is fairly affordable now, but if they wanted to re-release it anyways (or redeco) that would be ok. I'd rather have him that Cat Miin or whatever the name is . Jared also says that someone just STOLE the Commander Bly paint sample right out of Hasbro's display cabinet, when a Hasbro rep had it opened to rearrange a few of the figures inside. The Hasbro folks are saying it's going to probably take a couple months to get the figure repainted and reapproved by Lucasfilm now, as that was apparently their only copy. ^^ Are you ******* serious? INSANE! Keep an eye out on eBay for that ******! You gotta be ****in' me. Thanks! Guess that clears that up... another EU-esque figure I didn't realize I needed until just now. As for the dillwad who stole the Commander Bly paint-sample - Dumbass! Won't that be fun if the figure is substantially delayed or cancelled because of that pukehole.